1) Build lasting peer relationships. The most recent statistic I’ve read indicated that the unemployment rate among people with disabilities is 80 percent. The absolute best opportunity you will have to build relationships with peers will be while you’re in school. In 2016, social media makes connecting outside of the school environment easier. Kids use Facebook and Twitter to connect with friends, and that’s great. But finding ways to actually be with friends outside of class is still crucial. This may take some real effort in different ways with able-bodied friends and friends with disabilities. Try to organize a monthly movie night, go to events at school even if you feel like you’re part of the background, and seek out activities with other kids with disabilities. While the social media generation will find it old-fashioned, email is still a good tool to use to connect on a more significant level than “liking” something on Facebook. As you get older, consider sending those antiques called Christmas cards. When graduation comes, things change in a heartbeat — people get busy with careers, family, etc. Casual school relationships are replaced by the guy in the next cubicle. Just like you see your buddy every day in science class now, he’ll see 10 to 20 people every day at work. Many people with disabilities may struggle to be the guy in the next cubicle. Building stronger relationships now will help you maintain friendships that can be quickly forgotten after school. Even in 2016, it will help kids have friends that are part of their lives instead of one of the 257 friends on their Facebook page. They also might help you with finding a job some day. Because relationships can be especially hard to come by growing up with a disability, it’s only natural to find things to fill the void. TV is your biggest escape, especially watching sports. There was a time you wouldn’t miss a Philadelphia 76ers game for almost anything. The internet and video games may be the things that fill the void today. I know you also lift weights, listen to certain sports talk shows, etc. You have your routine — still do in 2016. These seemingly mundane things become very important because they’re yours. When the rare invitation comes along to do something else, you might be reluctant to skip what you had planned for something that may or may not work out well. Do it. When others might scoff at the notion that you want to follow your routine instead of going into an unfamiliar situation, push past the natural instinct to be protective of your habit and do the new thing. Take every opportunity to do something new. The opportunities might not be there later on. Even if you go to a movie you didn’t really want to see with someone you’re so-so about and the night stunk, you did something different. You took care of your own needs a little more than you would have if you were with a close acquaintance. You socialized in a difficult situation. You were around 30 to 50 other people, catching glimpses of how other people interact. It will add to your experiences and help you better handle a future situation. 3) Make a habit of independence. Throughout your time in special education programs, including being mainstreamed, you’ve eaten lunch with something called a sandwich holder. It’s a plastic device that holds a sandwich with a handle to hold, instead of you trying to pick up the sandwich without crushing it in your not-so-gentle grip. The problem with it is that it doesn’t make you the least bit independent — you still need someone to put the sandwich in the holder and adjust it every couple bites. It’s ridiculous. In reality, it’s a tool that makes life easier for the aides who help you and other kids at lunch. When you get to college, the lack of services will force you and Mom to realize that you can eat a sandwich with a fork if it is cut up. No, it’s not a complete solution, but it is a much greater level of independence. Using the sandwich holder all those years, I think, is akin to the habit Mom and I still fall into of allowing her to do things that I would normally do independently if I was alone. At times, for example, Mom will even tell me to leave my dishes on the table (or I do it on my own) when normally I would put them in the dishwasher. It’s easier to let Mom do it. It’s faster. There’s less chance of an accident. These things are all true. But these things also lead to a mindset of allowing others to “help” when they’re around, which eventually makes you more and more reliant on that help. When the time comes that you’re on your own to do something, it can be more difficult. Break the habit now and grasp every ounce of independence you can. It’s just like anything else — the more you practice being independent, the better you’ll be at it. 4) Do something you really enjoy. Rob with his mom, Donna, and nephew, Patrick, cycling in Philadelphia. One of the biggest “treats” you ever got in school was riding the adaptive cycle in physical therapy. Yet, it was about 30 years later before I got into adaptive cycling. Cycling quickly became one of the best parts of my life. So what happened in the interim? First of all, you got to use the cycle in physical therapy so rarely, it never clicked in your mind as something you loved. Besides the lack of opportunities, I think that a lot of kids with disabilities and their families get so caught up in day-to-day life with a disability that they forget the kids need to have fun. You had one special education teacher in third or fourth grade (the school didn’t have traditional grades) who literally gave hours of homework on a nightly basis. You’d get home around 4 o’clock, do homework (usually with Mom writing for you) ’til dinner, sometimes more after dinner, then it was bath time. Even in a reasonable year, there was just so much extra “stuff” to deal with that the idea of a fun activity was often unheard of. Find some. For all the same reasons other kids have extra-curricular activities, kids with disabilities need them. They clear your mind, create interaction, and so much more. If activities aren’t available at school, do something at home and make it a priority. You wrote two “books” as a kid that you actually got Mom and Dad to make copies of so you could sell them. You even started a school “newspaper” when you were around 10 years old. Along with a couple friends working at it on your own time, you put out two or three issues before the end of the school year. The following year your teacher wanted to make it a class project and that was the end of it. The point is you’ve always wanted to write. The only real mistake you will make with writing is not pursuing it enough. Don’t waste time pursuing other possibilities you know aren’t right for you or listening to people tell you to follow a more stable career path. So far, my writing ability is the only thing that has ever brought me a paycheck, I was always able to put my work up against anyone in my peer group, and the profession has only become more accessible to me. You know your disability and your abilities better than anyone else. Trust that knowledge always. When you find what works for you, go with it. Rob J. Quinn recently published a novel, The Birth of Super Crip. Learn more about the author and the novel here. A version of this post first appeared on The Mobility Resource. Rob J. Quinn is the author of The Birth of Super Crip. 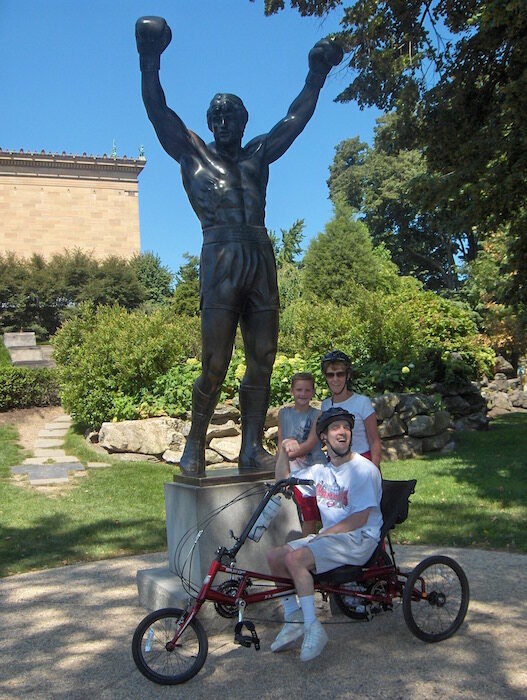 He started as a freelance writer at the Philadelphia Inquirer Sports section and wrote several articles on the disability community in the local section of the paper. He moved on to eventually work full-time for a leading children’s book publisher, and later spent two years working for a nonprofit, which worked to assist people with disabilities purchase the assistive technology they need to live more independently.